When I first started building this I thought I was building a ‘Starscream jets’ deck. After playing this weekend though, I couldn’t have been more wrong! A few weeks ago, on the weekly Covenant live stream, we opened a booster box of the Transformers TCG, built decks using the cards we opened, and then played a game. I was hoping to be able to play a jets deck and was lucky enough to open three Transformers that formed a perfect 25-star team, Starscream, Thundercracker, and Skywarp. If you missed it, you can watch the archived video below. One of my favorite parts of a new game is the learning curve of the first few months of play. 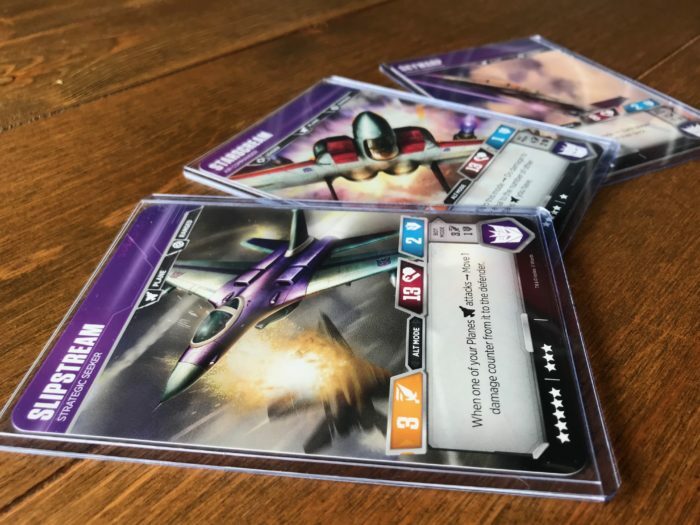 Getting a new set of cards or building a new deck is exciting in general, but nothing quite matches the experience of really exploring a new game system. In my experience, those first few months are filled with a lot of mistakes. This weekend was no exception, I made so many mistakes! There were turns I forgot to draw a card and others where I would forget to flip a Transformer at all. Often times, my Transformers were on the wrong side or I would activate them in what I would later realize was obviously the wrong order. It didn’t take long before I started feeling like I was making good plays. While my gameplay was getting better, I was still getting stomped by a variety of decks. It started to become painfully obvious how far behind the curve my deck was. Every deck I was playing against had a unique strength they were focused on maximizing, which went beyond the theme of the deck like ‘cars’ or ‘jets’. As an example, the first deck I played against could be described as a ‘tanks’ deck. Thematically, all the Transformers in the deck were tanks. After playing against it though, I would more aptly describe it as an armor deck. Every card in the deck seemed to reinforce the strength. The Transformers all had high armor stats, the upgrades either gave armor or Tough, and almost all of the cards in the deck had blue pips. Very quickly, I needed to hit for 10+ to score even a single point of damage! It made up for it’s lack of orange pips by including cards that give Pierce. This meant the deck could do damage regardless of what it flipped on offense and all the while, it was almost impossible to damage. Meanwhile, my deck was very balanced (also known as mediocre). I had fairly even numbers of everything, from pip colors to upgrades and actions. The problem was, I really wasn’t doing anything particularly well. My flips were pretty consistent, but never really having a major impact. My deck had a theme (jets), but it completely lacked a core strength it could leverage. After getting beat several times, I knew I needed to find a core concept to focus the deck around. I noticed both Starscream and Slipstream (a convention exclusive, 8-star jet a friend had sent me) had abilities that let me deal damage directly. As I looked through my collection, I couldn’t help but notice the cards that could also deal direct damage. I realized that my ‘Starscream jets’ deck needed to become a direct damage jets deck. While this deck isn’t even close to being optimized, it was evident after only a few games how much better it is. The deck has 12 direct damage cards. Paired with Slipstream and Starscream, this creates a stream of fast, unpreventable damage. I also added a few cards that give me Pierce, like Piercing Blaster and Bigger They Are. This lets me completely forgo caring about what cards I flip during an attack. 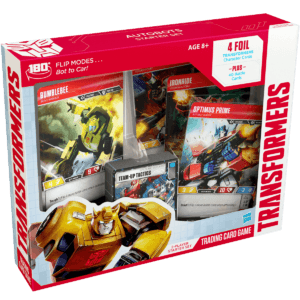 The biggest weakness of the deck currently is how fragile the Transformers are. While I can deal a lot of unpreventable damage quickly, I also end up taking a lot of damage. Once I start losing Transformers, both Slipstream and Starscream get less effective at dealing direct damage. My next iterations will experiment with ways of making the jets more defensive and healing damage. Either way, I have to find a way to keep my jets on the table! If you have any ideas or advice for this deck, I would love for you to leave them in the comments below! 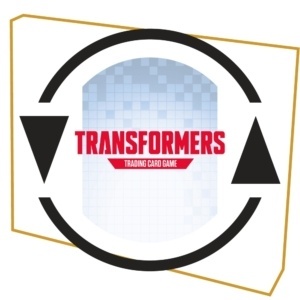 If you play the game, check out our Transformers TCG subscriptions if you want to automatically receive future sets without keeping up with set announcements or pre-paying months in advance. 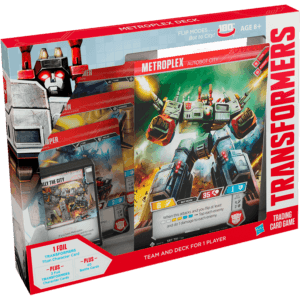 If you are interested in the game and haven’t tried it out yet, check out our Learning Transformers series for a run down of everything from how to play the game to what to buy to get started.